The Boston University women’s soccer season ended Sunday after Louisiana State University eliminated BU (11-7-4, 7-0-2 Patriot League) from the NCAA Tournament in a penalty kick decision, becoming the first NCAA match in nine years to require the tie breaker. The Terriers earned their spot in the tournament after claiming its fourth Patriot League championship after going unbeaten in conference play, including a win against Colgate University in the regular season’s final match that clinched top seed. BU head coach Nancy Feldman said that the team worked hard to establish its methods and culture, and it displayed these characteristics through the end of the season. Through the first half, the Terriers built strong offensive pressure with sophomore forward Anna Heilferty making three of her seven total shots by the 10th minute. Senior defender Royce Light and freshman midfielder Taylor Kofton both made header attempts within five minutes of each other, with Light’s following shortly after a shot off the post, but both sailed harmlessly over the crossbar. It took until the 39th minute for LSU (13-6-4) to force freshman goalkeeper Morgan Messner into action, stopping a shot from outside the 18-yard box. Messer made all three saves during the first half while Tiger goalkeeper Caroline Brockmeier was forced to stop two of BU’s 11 shots. The Terriers only increased their attack in the second half and fired off 16 shots. Brockmeier knocked away five attempts on goal, including a close shot from senior midfielder Dorrie Varley-Barrett that required a diving save from the LSU goalkeeper. However, neither team was able to solve its opponents within 110 minutes of play, sending the game into penalty kicks. Sophomore defender McKenna Kennedy got the first ball of the afternoon past Brockmeier with BU’s opening kick. While Messner stopped the Tigers’ first three kicks, back-to-back conversions in their fourth and fifth attempts sent LSU into the NCAA Second Round where it will go against the fourth-seeded University of Southern California on Friday. During the season, BU alternated its goalkeeper. While Messner was in net for the Terriers’ 3-0 Patriot League semifinal win against the United States Military Academy, sophomore goalkeeper Amanda Fay secured the conference championship with a three-save performance against Lehigh University. Feldman said being able to rely on both goalkeepers aided the team through the latter half of the season after Fay had returned to play after an injury, and that maintaining the cycle between the two was less disruptive than having them split time within a single game. Before the tie against the Tigers, BU hadn’t dropped a match since Sept. 13 when it went against West Virginia University. It had been the first stop on a five-game, shutout winning streak for WVU (15-4-3). The Mountaineers also advanced to the second round of the NCAA Tournament after having defeated Radford University 6-0 and not allowing a goal in the postseason. While the Terriers had their own shutout streaks — they allowed only two goals during their Patriot League season, making for nine clean slates — the loss to WVU capped a 1-7-1 out-of-conference season. BU then opened its conference season with a 1-1 tie against American University where senior forward Yari Bradfield, the Patriot League Offensive Player of the Year, sent a penalty kick past Fay in the first minute of the game. From there, the Terriers built up a 14-2 goal differential, going 8-0-1 through the rest of the regular season, earning the Patriot League regular season title. The Patriot League recognized five players with its postseason rewards — Heilferty, Kofton, Varley-Barrett, and senior defenders Chelsea Churchill and Libby Closson — and named Feldman head coach of the year. While Feldman previously stated that the team made coaching this season “a gift,” she broke through several benchmarks this season including her 300th win with BU and her 400th overall, and will be receive the Women’s Soccer Award of Excellence. 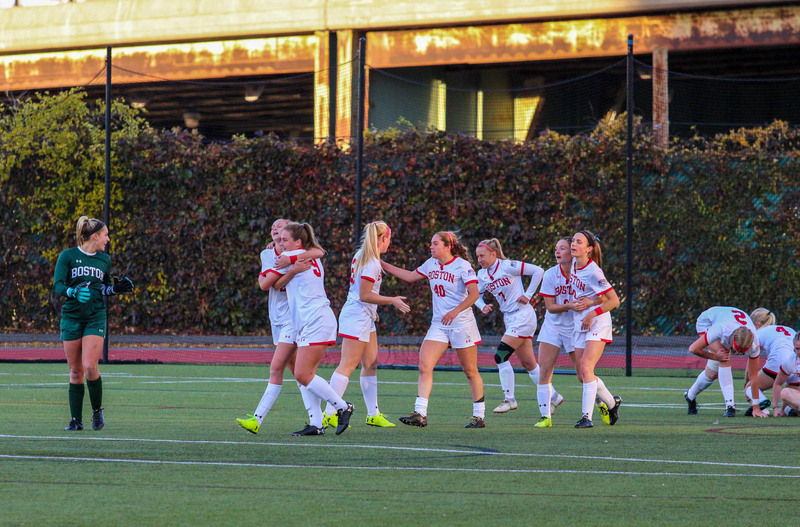 Once in the postseason, a brace from junior forward Shannon Keefe rose the Terriers above Army in the semifinals, while a header from Heilferty earned the team its conference title in what would be the team’s final win of the season. Keefe’s goals had been her first of the season, a testimate to the bench’s talent, Feldman said, who will need to continue to produce with the senior class graduating. Feldman said she was in a state of “mourning” for the 2018 iteration of women’s soccer, describing a season where teammates and coaches grew close. She said the team’s 10-member senior class established a sense of positivity starting in the summer and extended the mood onto younger players, establishing the team culture and benefiting it throughout the course of the season. Part of what makes Feldman excited for the future is the knowledge that the younger players have learned from a group that modeled BU women’s soccer at its finest, Feldman said.